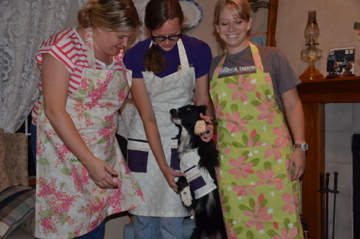 Second sewing class with the girls and one dog named Wendell. Yes even Wendell had a hand made sewing project. 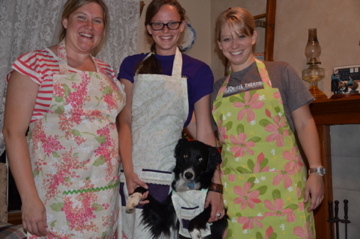 This week the gals made aprons. 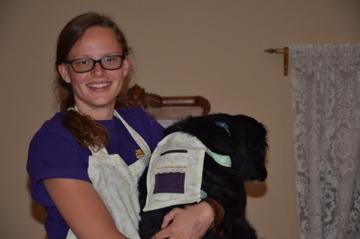 Who doesn't love a good apron to wear while making that special meal or just hanging out in? I'm hanging clothes on the line with my apron on, planting seeds in the garden, fluffing the "nest"and sometimes I wear a lovely linen apron over a nice pair of capris with a newly ironed white tee, BEAUTIFUL ! Aprons are so versatile, no wonder they have been around for hundreds of years. 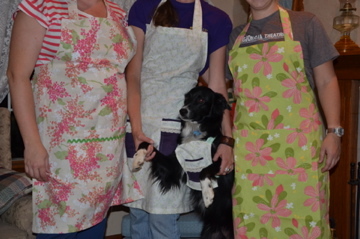 but he loves his new apron. That is my" finish it up Friday" for me. Hooking up with Crazy Mom. Sunday afternoon and out for a walk, the weather is fantastic. Love being out doors in the spring with sun shining, birds singing and it's not hot yet. Have been knitting and sewing of late, hope to have some finished projects soon. really ! i say, well i can teach you and your friends how to sew ! i even have all the fabric and patterns [ hard to imagine i know ] to get everyone started. and never, never throw away the manual ! using vintage sheets found at Good Will. not bad for beginners ! and we ate pizza too. 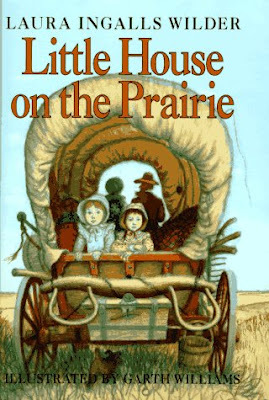 I’ve always wanted to be a homesteader, living that romantic prairie lifestyle (of course ignoring Indian wars, prairie fires and influenza outbreaks). I think it was all those Little House on the Prairie and The Waltons episodes my mom made me watch as I was growing up. I would spend hours outside playing like I was Laura Ingalls; dressed up in old skirts we’d find at thrift stores to use as costumes. Pretending life was harder than the 21st century of convenience I was actually growing up in. I would go to fetch my water (from the hose) and pretend to feed my cows, horses and chickens (our dogs and my little sister). 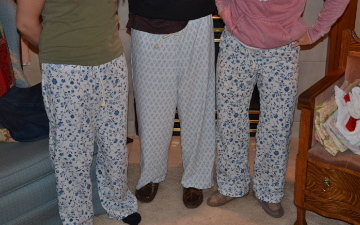 Oh how wonderful to know that I did influence my children! This is a true laugh out loud story. i will have the prettiest tomato cages in the neighborhood ! these soap bars were made by my friend tara and myself. yes that miracle that happens every time this year !!! seeds that i planted 10 days ago are pushing up out of the ground!! looking out the window sipping my first cup of coffee this morning my eyes fell on these ever so small plants. i squealed with glee, adjusted the specks to be sure i was looking at my first veggie plants of the season. grabbed the camera and out the door to get those first pics. the first plants of summer is as exciting to me as watching my young one year olds' taking their first steps. i will be kicking my heels up all day long. most likely be out planting more seeds. easter center piece made my me, myself and i.
about the most easterly thing i've done my entire life. i am not a big fan of the easter bunny and easter baskets. i gave up the baskets and all that messy grass for mason jars early in my children's young life's. caitlin even claims one year i put the mason jars on the table with the bags of candy and instructions to fill your own! since i made the center piece for easter i thought i might as well make an easter dinner! and cook i did, all comfort foods topped off with the best coconut cake i have sunk my teeth into ever! erin set a beautiful easter table with dishes going back through three generations. invited all family living in norther colorado. for some reason i took very few pictures. they do not care for their pictures to be taken but as with all other things i taught them, they will see the value in these photos years later. enjoy the tulips in your yard or vase. this past week has been a busy active week for me. i returned to work and did a full 3 shifts in the OR. everything went well, my back and leg were in minimal pain but then again being on a rather large dose of steroids helps. actually i have enjoyed this regime of steroids, eric says i have not shut up since the first pill was taken, i think he is looking forward to monday when i am done with this oral steroid round. the only side effect i have noticed and everyone who knows me is i look like i am seven months pregnant with chipmunk cheeks and ankles that remind me of my aunt pat. [ she always had swollen ankles...why? no idea ]. but since feeling good i have been getting out in the sunshine. over at My Sister Knits, julie had a demo on how to plant flower pots ! how great is that ! her gardens are beautiful and a very comfortable serene place to sit and knit. i had the opportunity to meet several interesting ladies. knitters are soo pleasant and wonderful to talk to. this chicken watches over her yard. these tulips are in my yard, the spring garden is beginning to look alive. i have become obsessed with crochet...why? i find it mindless and soothing. i learned to make " bobbles" and find this stitch to be so rewarding. breaking through the ground ! i am not a pastel color way person but can't seem to get enough of these colors!! wishing all a wonderful peaceful EASTER. i think you will be amazed!